Retirement Plan Gone Awry: What Do I Do Now? Type the word “retirement” into any search engine and you’ll be directed toward hundreds of web pages, articles, and videos presenting advice on how to save and invest for your retirement. But what if you’ve already been retired for several years, you are already collecting Social Security, and after taking a closer look, you begin to realize that you will soon be outliving your retirement fund? You may have planned ahead by saving and investing for decades pre-retirement, but somehow it simply hasn’t been enough to cover your expenses post-retirement. Although this can be an overwhelming realization, there are several options available, many of which do not require financial expertise. With a little motivation and “Thinking Outside the Box”, you can remain financially secure throughout retirement. Option 1: Re-enter the workforce. Although you may not be as energetic as you once were, consider finding simple work for modest pay. Think Outside the Box: This job does not have to be a traditional position. For example, parents are happy to pay for a reliable person to watch their children, and grown children are happy to pay for a reliable person to help tend to aging parents. If you work in a more traditional position, you might be entitled to free services or discounts which could work in your favor during retirement as well. Option 2: Offer your knowledge or skills. After decades of working you most likely picked up a few tips and tricks along the way, which someone may be seeking. Advertise with your local newspaper offering your services as an informal mentor or advisor in fields in which you have some expertise. Think Outside the Box: If you don’t have money to spend on a newspaper ad, ask your local shopping markets and retailers if you can post a sign or flyer for free. And of course, spread the word with your family and friends. Option 3: Prioritize your spending. It’s easier to stay financially viable during retirement if you are paying attention to your expenses. Look for deals on needed items, lessen finances spent on clothing, entertainment, and travel, and watch out for spending too much on loved ones. Think Outside the Box: Some not-so obvious changes in spending patterns that can make a difference during retirement. These include using liquid forms of payment (cash, check, debit card) rather than racking up interest bills on credit cards, buying generic rather than name brands, and doing any necessary shopping at church/charity stores. Any of these adjustments can certainly add up in your favor over time. Option 4: Turn your assets into cash. You may own a home, car, valuables, or life insurance policies which could be converted into liquid assets. Think Outside the Box: Converting to liquid assets doesn’t always mean the asset has to be sold. A reverse mortgage may allow you to withdraw equity from your home without having to move. Also, consider the possibility of renting out a room in your house, or even consider renting your entire house and living with friends or relatives, or in a modest apartment. Option 5: Re-invest and re-grow your nest egg. Once you follow the previous suggestions, you might start to find extra finances available. Rather than spending or only saving these funds, stay on track with what you have been doing and look into ways to reinvest your small amounts of income. Just because you are retired does not mean you can’t continue to grow your nest egg. Think Outside the Box: Traditional thinking says the older we are, the less risky our investments should be. However, since you do not have as big of a nest egg as you did years ago, investing with a little more risk tolerance might create more growth. Option 6: Get by with a little help from your friends. It can be tough to ask people for help, since most of us like to feel independent, and having to explain that we fear outliving our savings can seem embarrassing. However, it is very likely that you have a lot of people in your life that would be happy to help, even for a short period of time. They can be friends or family. This is not the time to be stubborn with pride; rather this is the time to be smart and reach out to others. Think Outside the Box: Look into retirement resources and services available within your community, such as services provided at your local church or within a nearby retirement community. Option 7: Get in touch with an expert. Expert financial advisors might take a peek into your assets, liabilities, income, and expenses and give you a better picture of what changes you need to make. Experts may also be able to help you make adjustments in your investments or assets which you may not have otherwise been aware were options for you. Think Outside the Box: If you don’t have the funds to seek ongoing expert advice, at the very least try to find a non-profit firm or government agency who would be willing to offer a short analysis for free. It doesn’t hurt to make a phone call and ask. And as always, make sure to utilize your network of friends and family to see if they know anyone who might be willing to help. Good luck! The Southeast Missourian daily newspaper published a time-relevant online article entitled “Holiday Budgeting: Some Ways to Keep Your Holiday Spending Under Control.” We have included the article in this post, or you can click here to read the article in its original form. Comment below to let us know if you found any of these suggestions helpful! 1. Make a List: Writing down the items that you want to purchase can help you to avoid spending money on unnecessary things. Additionally, the list will remind you to buy everything that you need in order to spend a wonderful holiday with your family. 2. Always Stick to Your Budget: Another great financial tip that can help you to avoid holiday overspending is to stay within your budget. If you are tempted to spend more money than you should, you can shop together with one of your friends, who can provide a voice of reason whenever you need it. 3. Look Out for Bargains: Although you cannot find some really good deals during the holiday season, there are major price variations among the same products provided by different stores. To benefit from these variations, you should take the time to compare certain offers. 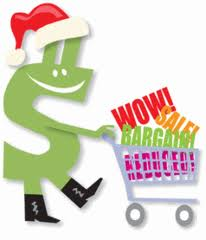 Another great idea would be to look for presents before prices go up for the official shopping season. 4. Check Return Policies: It is very important to verify the return policies of various stores prior to buying gifts. This is because these policies indicate the terms that all customers who intend to return goods must comply with. These terms mainly relate to time frames and condition of goods. 5. Record Your Purchases: This is another useful financial tip for the holiday season. Keeping track of your purchases can help you to understand whether you will exceed the limit of your budget or not. 6. Choose the Right Payment Methods: If you wish to lower your debt, it is very important to leave the credit card at home. The best payment methods include debit cards, checks and cash. 7. Transfer Your Credit Card Balance to a Low-Interest Credit Card: If you possess a low-interest card, you should transfer the balance of the high-interest cards to it. This can be a very lucrative financial practice because paying off $1,000 at 6% instead of 18% interest will save you a lot of money. 8. Use Stores’ Point Structure: Numerous stores are involved in cash-back reward programs, which offer rebates on particular purchases. Although most programs only offer small discounts, these can add up to a substantial savings over one year. 9. Get Gift Cards: Using gift cards in order to keep your budget under control is a truly beneficial idea. Occasionally, this type of deal helps people to get two gifts for the price of one. 10. Use Coupons: A large number of websites offer coupons that can bring you significant discounts, especially during the gift-giving season. The time to look for financial advice is before the official holiday shopping season starts. Although shopping might not be as much fun as you expect, the tips presented above can help you to get through the holidays without increasing your debt. With the holiday season fast approaching, many of us feel an increasing urge to give back to our local communities by supporting charities. Money Talks News recently posted a video describing the Smartest Ways to Donate to Charities. Follow these steps to ensure the money you worked so hard for will continue working hard for those in need, and make sure to listen to the Barry Birr Show on KFEQ 680AM at 9:30 a.m., Monday, November 18th to hear Dan discuss this topic further. 1. Choose a charity whose mission aligns with your passion, whether the assistance includes serving hot meals, helping families get back on their feet, counseling for crisis management, or providing shelter or supplies. 2. Research to find the most efficient charity to meet your goals. Recommended websites include Charity Navigator, the Better Business Bureau, Guide Star, and Charity Watch. Find out how much of every dollar raised goes back into the charity program, and donate to the ones with higher percentages. 3. Give directly to the charity. Do not donate through an agency or telephone solicitors, as they usually keep a large portion of the donations they collect. 4. Get yourself involved and donate your time in addition to your money. Lending an actual helping hand not only aids others in need, but it can also be very rewarding. If you are in your 20s or 30s, retiring early is within your reach! Check out this video from Investopedia to learn a few tips and tricks on how you can achieve your early retirement goals.